TRIANGLE FUN FOLDS IN CLASS THIS WEEK – OR GRAB IT BY MAIL! Fun Fold cards certainly give a WOW! to the receiver. OR get the Class By Mail. WHEN: Friday 8th March 10am or Saturday 9th March at 2pm. Order the card kit with full instructions $20. Stamped images not included but you can substitute with what you already have or order the stamps separately. Here is a sneak of the cards. Let me know ASAP to reserve your seat by commenting here or emailing me. 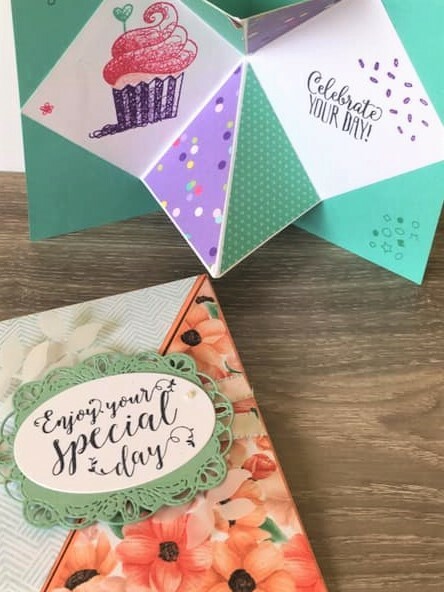 BIRTHDAY CHEER WITH THE STAMPIN’ BLENDS! I have another card for you using the Birthday Cheer Bundle. This was another card we made at class last week. Some tips to make your own. Firstly, cut the White card piece with the Rectangle Stitched Framelits die before you stamp. Then you know where to stamp your images. The images need to be stamped in Memento Black ink so it can be coloured with the Stampin’ Blends. The smaller sentiment is stamped on a strip of Mint Macaron. Rather than flag the ends of the strip or punch it with a Banner punch or a die I decided to keep it straight and wrap some of the Nature’s Twine around it. On the Rich Razzleberry card mat first stamp your images in Razzleberry ink on the card and then run it through the Big Shot with the Subtle Embossing Folder. It adds just a little texture to the card. I really love this folder for creating the light texture. I think it gets missed in the catalogue. The Birthday Cheer Bundle and the Subtle Embossing Folder are now available in my store now -> HERE. Please use the Host Code: Q6XB6QR6 OR you can contact me directly. Thanks for your order. I appreciate each and every one of them. Be sure not to mark your order anonymous or I won’t be able to send you out your small gift. Thanks for visiting. I am off this weekend to the huge Craft Alive show. I am holding a booth there with 3 other wonderful demonstrator friends. It has been months and months of planning and work. I am exhausted already to be honest but I hope it goes well. 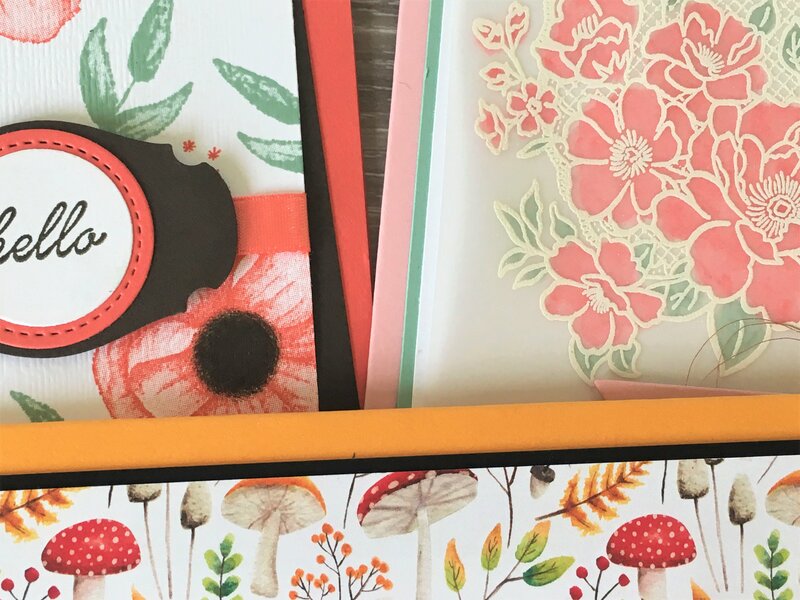 cards, Cards by Mail, Classes, Stamp At Home Kits, Stampin' Up! BIRTHDAY CHEER FOR THE NEW YEAR CLASS OR GRAB IT TO GO! We all need birthday cards. At this week’s class we will create some special cards for upcoming birthdays with the Birthday Cheer Bundle. This is a fun new product in the Occasions Catalogue. If you are a Wollongong local, come along. Can’t make the class?? Grab the Class-To-Go card kit. See it below. WHEN: Friday 1st February 10am and Saturday 2nd 2pm. COST: Check the option that suits you. 2) Free Class with Birthday Cheer bundle purchase** – $81 with free Grapefruit Grove and Lovely Lipstick Foil Sheets sampler. 3) Class to Go – $20. ** In addition with the purchase you will receive this month’s Tutorial bundle for free containing tutorials for 10 exclusive projects.